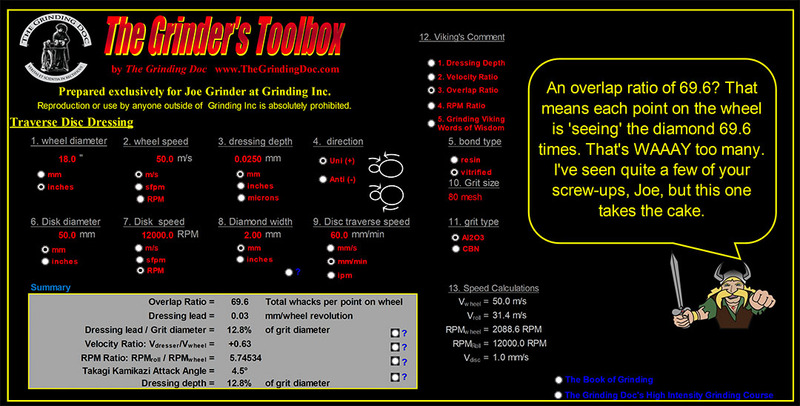 What is the Grinder’s Toolbox? The Grinder’s Toolbox® is a program developed by The Grinding Doc for calculating fundamental relationships in grinding, dressing and cooling. It is an enormously useful tool for determining such things as: wheel sharpness during dressing; wheel roundness during dressing, coolant velocities and flowrates, workpiece roundness during cylindrical grinding, specific material removal rates, grit penetration depth and aggressiveness values and how changes to speeds & feeds will affect wheel wear and the risk of thermal damage. The Grinder’s Toolbox is included with purchase of The Book of Grinding or attendance to the High Intensity Grinding Course. A popular feature of The Grinder’s Toolbox is The Grinding Viking, who gives users comments and advice about their grinding, dressing and cooling parameters. The Grinding Viking is not always polite, but he is always truthful. 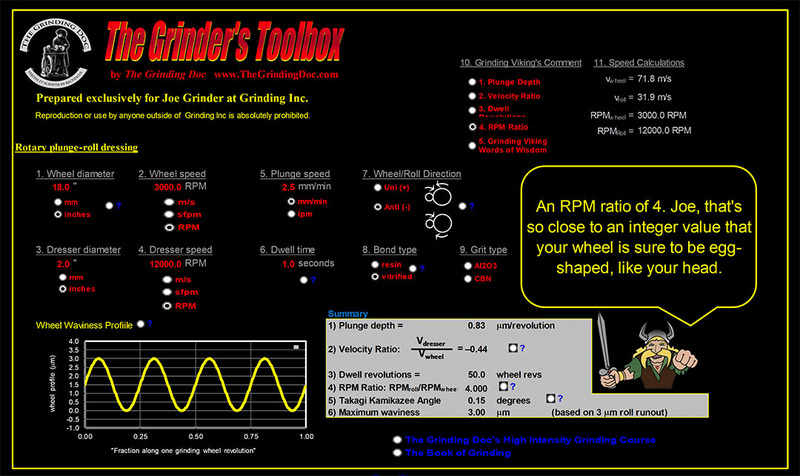 The program for cylindrical-plunge grinding allows users to calculate the grit penetration depth, aggressiveness and specific material removal rates for different combinations speeds & feeds, helping the user increase feedrates while making him or her aware of any possible detrimental effects in terms of wheel wear, wheel self-sharpening and burn. It also alerts the user to issues with workpiece roundness due to “integer values”. For advanced users, the program predicts workpiece surface temperatures and the depth of thermal damage. The program for cooling calculates the coolant velocity from flowrates and nozzles dimensions, to determine if the user has achieved the recommended “80% wheel-speed rule” (discussed in detail in The Book of Grinding). The program for traverse diamond disc dressing calculates the Overlap Ratio, speed ratio and RPM ratio, telling the user if the wheel is sharp or dull and if there are potential issues with wheel roundness, which can cause chatter marks on the workpiece. The program for plunge diamond roll dressing tells the user if he is dressing the wheel dull or sharp and whether his speed ratio, effective dressing depth and dwell time are correct. It also warns the user of possible “integer values”, which result in an unround wheel and chatter marks on the workpiece.